Shockwave therapy is medically known as Extracorporeal Shockwave Therapy (ECSWT) or Radial Shockwave. Shockwave is a new, effective treatment for severe cases of tendonitis, tendonosis, and scar tissue build-up. This cutting edge therapy is changing the way chronic injuries are treated. It offers a solution for stubborn injuries even when traditional therapy approaches have failed. 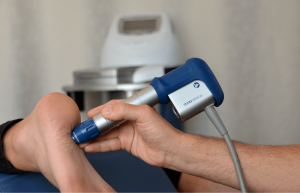 What conditions and injuries can Shockwave Therapy help? The treatment involves directing a deep acoustic energy pulse into an area of chronic muscle or tendon injury to stimulate local tissue regeneration and healing. The energy pulses stimulate blood flow and specific cellular activity resulting in muscle, tendon, and ligament repair. This leads to faster healing even in cases of deep, longstanding injury. Will Shockwave Therapy Work For You? Shockwave treatments are tolerated very well by most patients. Earlier sessions are done at lower settings to initiate the healing process and then a transition is made to higher settings and a more intense treatment. Sessions can be adjusted to your tolerance. Some patients experience a mild ache in the treatment area the day following treatment and there may be some reddening of the skin. Beyond this the treatment has minimal side effects. A typical problem usually requires four to six treatment sessions over 5-6 weeks. This therapy can also be used in conjunction with Active Release, Graston, IMS, and other traditional therapy strategies in building a comprehensive rehabilitation plan. If you are already engaged in therapy at another centre we are happy to provide shockwave alone to supplement your current physiotherapy plan. Preliminary studies of schockwave on osteoarthritis are promising. Since we know that some of the arthritis pain comes from the tendons and ligaments around the degenerating joint, it makes sense that pain would be reduced if you treated them. In addition, shockwave is thought to strengthen the bone underneath the degenerated cartilage. If you suffer rom arthritis pain please call us to assess your case. We are able to provide the service for $100 per session, although many clinics charge as much as $200-$250 for the exact same treatment. Treatments can be performed by either a chiropractor or a physiotherapist depending on your needs and coverages available. Shockwave can also be provided in combination with more traditional therapy approaches if a more comprehensive rehabilitation plan is necessary (additional charges may apply). Shockwave can be provided by either our chiropractors or physiotherapists, meaning a portion may be covered by your benefits provider. Some insurers including Blue Cross, Great West Life, and Green Shield allow for direct billing of a portion of the treatment cost. Any out of pocket costs for shockwave therapy qualify as a deduction as a medical expense on your federal tax return. Please consult an accounting professional for advice specific to your situation.